I know what you're thinking--"blogs are as ubiquitous as hydrogen molecules. Why read this?" 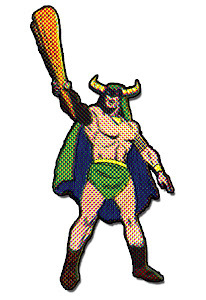 Simply put, I am a prehistoric superhero that lives in 70,000,000 BC. You're not. To me, being awesome comes naturally like eating or sleeping. So read my blog, or I will thrust my ridiculously massive hand through your chest and pull out your feeble heart like in Indiana Jones in the Temple of Doom. And then I'll use it like a hacky sack with my college stoner friends. Imaging waking up in the morning next to a humpback whale. Now you know what my morning wood is like. Who is the greatest superhero ever? Free CounterClick here to listen to Seduction City!